What does it mean that every eye will see Him? God is now quickening His first fruit company of sons who see His coming and who are beholding the appearing of His life within. To behold or to see signifies a knowing and understanding. Rest assured that in the finality of God’s plan for the ages, every eye will be opened to understand and know Jesus Christ as Lord. 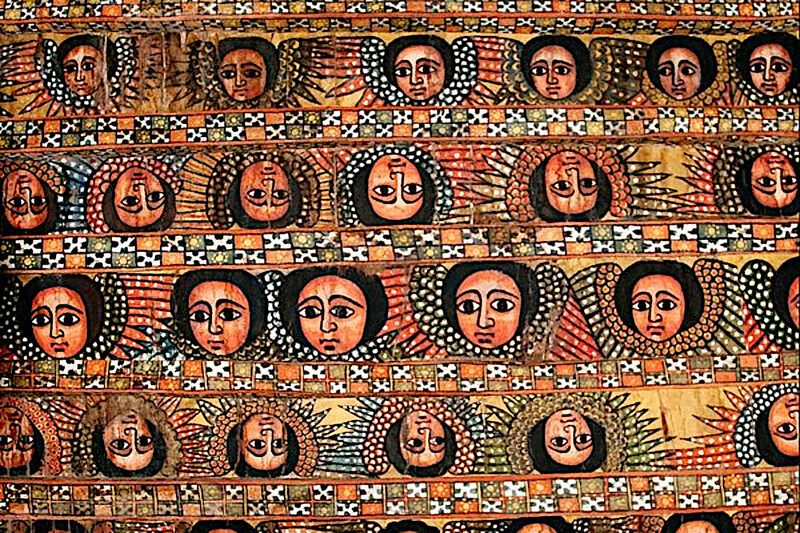 From the Debre Birhan Selassie Church, Gondar, Ethiopia. As all things draw closer to finding their culmination in Christ, there is a great expectation that EVERY EYE will see the coming of the Lord. Prior to His vision in Patmos, John had heard the Lord declare: “A little while longer and the world will see Me no more, but you will see Me” (Joh. 14:19). But now, he pens this marvelous hope in God’s redemptive plan for the ages declaring: every eye will see Him. So what does it mean that every eye will see Him? The text has often been misinterpreted to prove erroneous teachings about Jesus’ coming as a physical man. The popular assumption claims that during Jesus’ return, the skies will be rolled up like a scroll and every person will see Him before the Church is raptured. This assumption raises a number of questions. That people all over the earth will be able to see a man coming through the sky with their naked eyes is a crude notion even at the level of common sense. Some may argue that God will supernaturally make it possible for every eye to literally see Jesus in the clouds or that Jesus will make the rounds until every person sees Him. We can go on with a thousand other scenarios. But these are mere assumptions that have no biblical foundation and which are inconsistent with what the spirit of God teaches throughout scripture. Religion has created many assumptions to fill holes in its erroneous dogmas. Although not the focus of this message, I should add that the verse does not say that He comes through the clouds. Rather, it states that He is coming “with clouds” or according to the Greek “in clouds”, signifying association. Moreover, the Greek word used here for ‘coming’ is not indicative of a future event yet to happen but is a perfect tense which represents a past, present and future coming. It is a current and ongoing event. John wrote by the inspiration of the Spirit that every eye will see Him. This is a most glorious hope to those who understands its meaning. But who is it exactly that will see Him coming with the clouds? John tells us that it is inclusive of all those which pierced him and all kindreds of the earth. It’s not just those who have a physical body on the earth that will see Him. Every person who’s ever lived will see Him. Even Caiaphas was told by Jesus that he would see Him coming on the clouds of heaven (Matt. 26:64). How will Caiaphas see Jesus coming on the clouds of heaven? He died a long time ago. To lay hold of what the Spirit is saying here, we need to first understand what the eye means. Consider the eye. Jesus taught about the eye saying: “The lamp of the body is the eye. Therefore, when your eye is good, your whole body also is full of light. But when your eye is bad, your body also is full of darkness” (Luk. 11:34). In speaking of the eye being good, surely, He was not completely disregarding those who were physically blind. The eye is symbolic of our spirit. When Jesus said, the lamp of the body is the eye, He meant that the lamp of the body is the spirit. For, “The spirit of a man is the lamp of the Lord, searching all the inner depths of his heart” (Prov. 20:27). That the eye bespeak of the spirit is also relayed in the book of Revelation. John declares: “And I looked, and behold, in the midst of the throne and of the four living creatures, and in the midst of the elders, stood a Lamb as though it had been slain, having seven horns and SEVEN EYES, which are the SEVEN SPIRITS of God sent out into all the earth” (Rev. 5:6). The seven eyes are the seven Spirits of God. We will return to the significance of the number seven. Notice Jesus mentioned a good eye and a bad eye. A bad eye causes darkness to the whole body. Darkness represents a state of being where one is ignorant of divine things. It is a condition of spiritual death where the spirit of man remains dormant; unquickened by the Spirit of God. The remedy to darkness is the entrance of His light. Only when our spirit becomes infused with the life and power of the Spirit of God will our eye be good. Until then we remain dead, only walking in the consciousness of our sins and trespasses. Therefore, an eye that is GOOD signifies a quickened and complete spirit. The King James uses the word SINGLE instead of good. “When thine eye is SINGLE, thy whole body also is full of light” (Luk. 11:34). The word ‘single’ is the Greek ‘haplous’ which means “whole, sound, fulfilling its office”. When the spirit is single, it is fulfilling its office as the candle of the Lord. This is a singleness that is found only in Christ. Paul shares his concern for those who have been corrupted from this singleness saying: “But I fear, lest somehow, as the serpent deceived Eve by his craftiness, so your minds may be corrupted from the simplicity that is in Christ” (2 Cor. 11:3). This simplicity of which Paul speaks comes from the same Greek word that means ‘singleness’. It indicates the pureness and oneness of belonging exclusively to Him. Our spirit can only be single in Christ. It can only be perfect in Christ. It can only fulfill its office in union with Christ. Those who are joined to the Lord are one Spirit. They are single minded. They follow one will and one way. Their eye is good, it beholds Christ. Their spirit is quickened and fills their whole body with divine life. The seven Spirits which John saw point to this truth. The scriptures speak of the seven Spirits of God on various occasions (Rev. 3:1; 4:5; 5:6). This is not to say that God has seven distinct Spirits. Rather, the number seven in biblical numerology indicates spiritual completeness, perfection and wholeness. Thus, what John saw was the divine totality and absolute fullness of the Spirit of God found in Jesus Christ. We too are to press forward to lay hold of this perfect stature in Christ (Phil. 2:12-14). Only when we possess the Spirit without measure can it be said that our whole body is full of light. But attaining to this stature demands that our eye to be good/single, that our spirit be in union with His, and that it be continually quickened by the ever increasing coming of the Lord. I tell you of a most profound truth that brings me much joy: every spirit which God fathers will behold His glory and power at the revelation of Jesus Christ. This is what it means for every eye to see Him. We can read the verse in this way: behold, He is coming with clouds, and every spirit will behold Him. This is an all-inclusive seeing that men will experience once they become quickened in their spirit by His appearing to them. As you continue to read our initial text, you will see that seeing Him will cause all peoples of the earth to wail. Praise God! Only in the light of the revelation of His righteousness will men see their corrupted state and recognize their separation from the Lord. This is part of His purifying work in all men, to the end that God would experientially be joined to their spirit in oneness. God is now quickening His first fruit company of sons who see His coming and who are beholding the appearing of His life within. To behold or to see signifies a knowing and understanding. Dear saint, if you desire to partake of the glory of His life that is now being unveiled in His saints, you have to be quickened in order to behold Him in your spirit. For, we cannot apprehend that which we do not see. If you only behold the realm of the flesh then you will be bound to that realm and you will bear fruit of that realm. Vast multitudes of Christians will not stand in the new glory that God is unveiling today because they are blinded by their traditions and their cult-like following of their denominational sects. Men often reject what is not familiar. But when Christ comes in His fullness, we must be ready to receive Him in a dimension higher than what we have known or previously experienced. Dear beloved, there is a sound that is going forth in this hour that is calling men to behold His coming. If your eye is good you will see it. But rest assured that in the finality of God’s plan for the ages, every eye will be opened to understand and know Jesus Christ as Lord and be transformed in the light of His glory. Mikael Gebre-Mariam is the author of the blog Kingdom Truths.